Sheet pan Moroccan chicken is a super simple and flavor filled dinner that is perfect for weeknight meals and days when you don’t want to do the dishes! Lots of spices and a burst of fresh lemon make this anything but a basic chicken dinner! 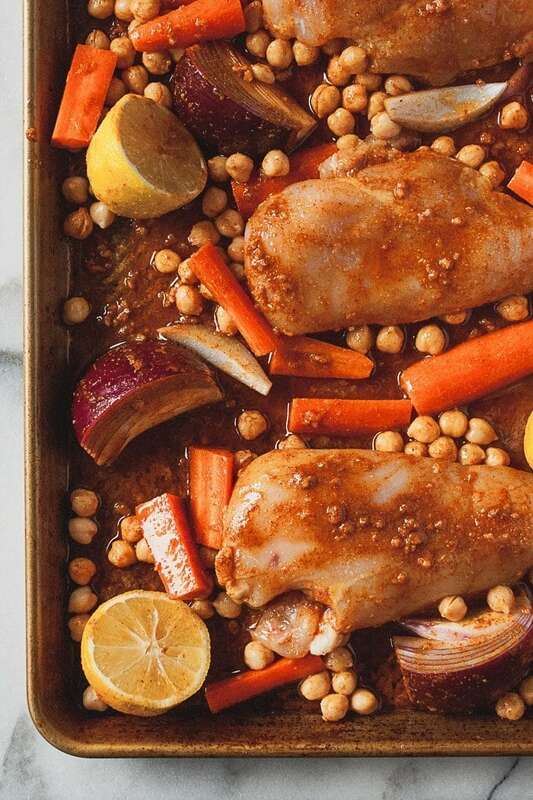 I wish smell-o-vision was a real thing because the smell coming off of this sheet pan Moroccan chicken is bananas. Well not literally bananas. It doesn’t smell like bananas. That would be weird. But it does smell strong and spicy and also sharp. And honestly, so so good. Yep, you guessed it. 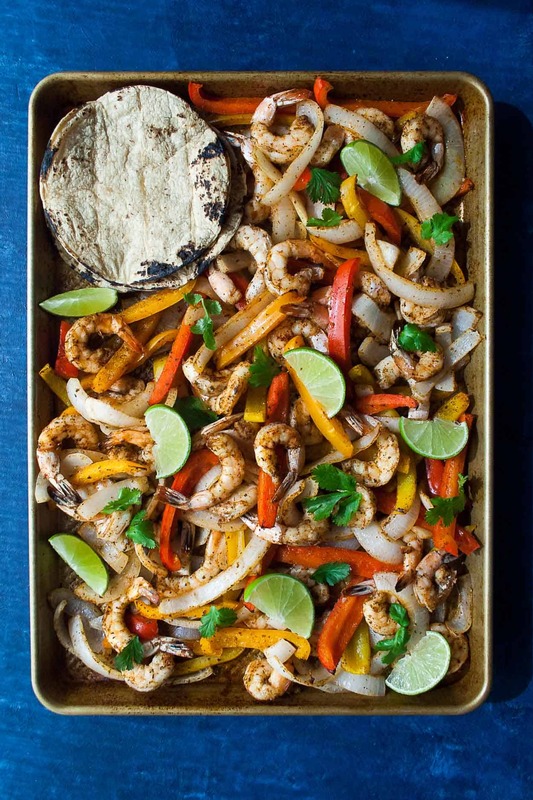 March is sheet pan meals month and I freaking LOVE that this entire meal is made on one sheet pan. I dedicated March to sheet pan meals because I need less in my life. In a world where more is more is more, where the hustle mentality is praised (thank goodness this is changing BTW), and where there is a constant pressure to say yes, I’m trying to cut back. I’m trying to slow down. I’m trying do less – to work less, to stress less – and that includes my meals. I’ve always been about simple, nourishing meals. If you’ve been here for any length of time, you know that. But I’ve really been trying to make things easy – for me, for you, and for Pat who always does the dishes. 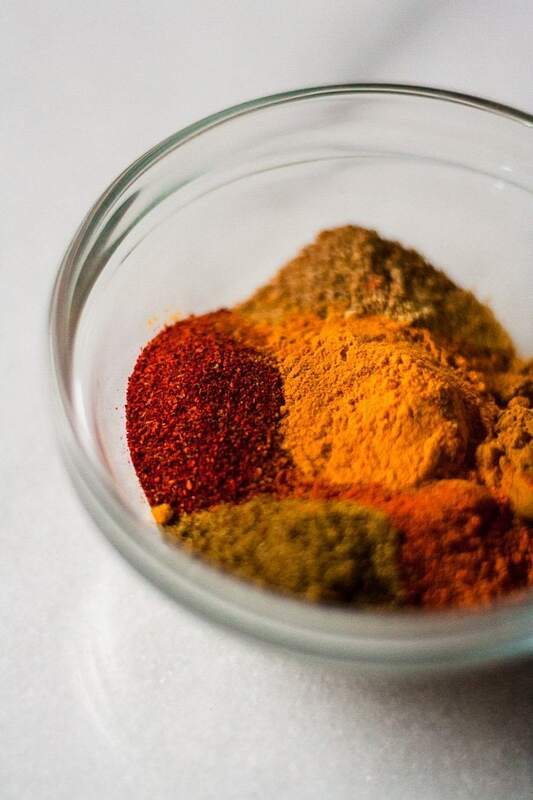 The blend of spices is what makes this sheet pan Moroccan chicken; the blend consists of garlic, paprika, cumin, coriander, turmeric, ginger, cayenne, and cinnamon. And of course, fresh lemon juice is the kicker – literally! There is lemon juice in the sauce and fresh lemon is squeezed over the top for some extra zing. 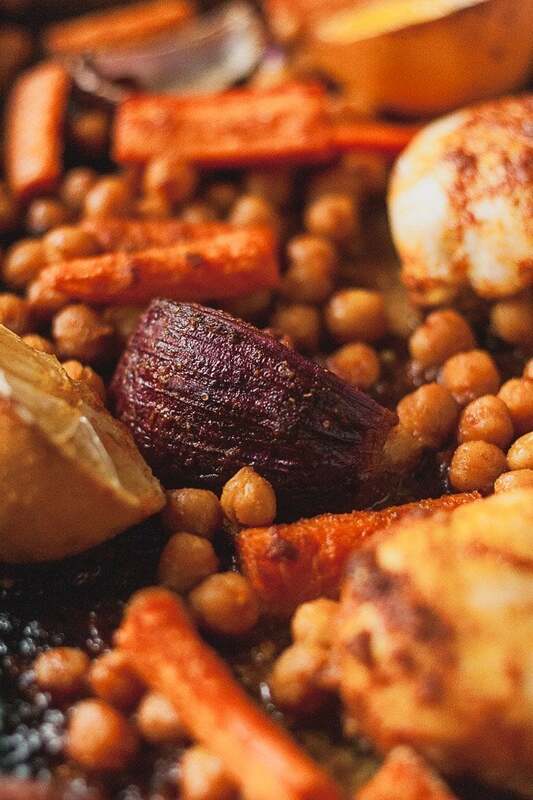 Toss in some carrots, a can of chickpeas, and red onion for a full meal and you are all set! 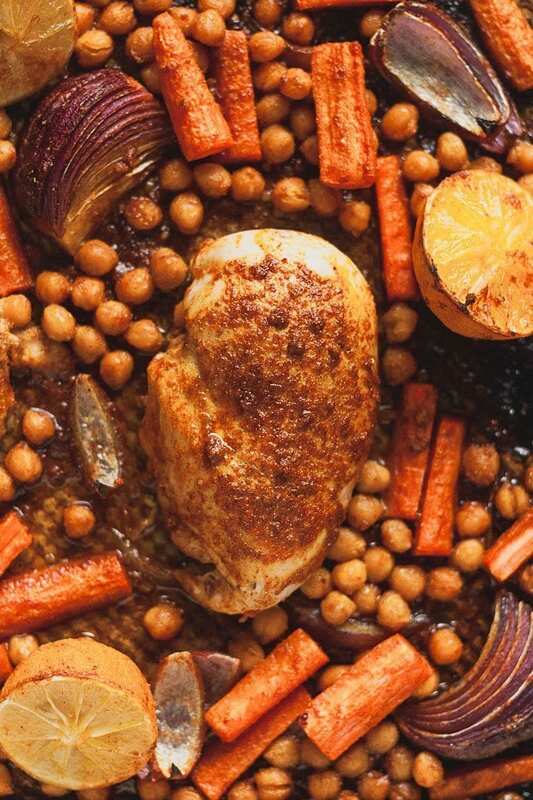 If you are looking for an easy dinner recipe, I hope you try this sheet pan Moroccan chicken, whether you are looking for ‘less’ in your life or not! When you make this recipe, remember to tag @imhungrybynature on Instagram! Prepare the sheet pan chicken. Place chicken breasts on a rimmed baking sheet. Add chickpeas, carrots, and onions to pan around chicken. Place lemon halves on sheet. Make the sauce. In a bowl, whisk together the garlic and spices and add lemon juice and olive oil. Continue whisking until fully combined. Pour sauce over chicken and vegetables and toss to coat all of the vegetables. Season everything with salt. Roast. 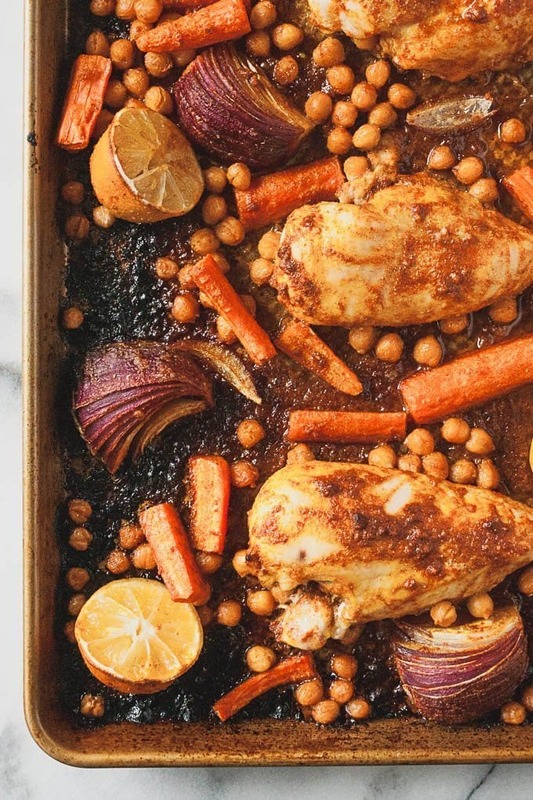 Roast the sheet pan Moroccan chicken for 35-45 minutes until the internal temperature reads 165 degrees and the vegetables are soft and caramelized. Squeeze fresh lemon juice over the top and serve immediately, making sure you scrape up all of the golden bits from the pan and spoon the olive oil sauce over the chicken and vegetables. 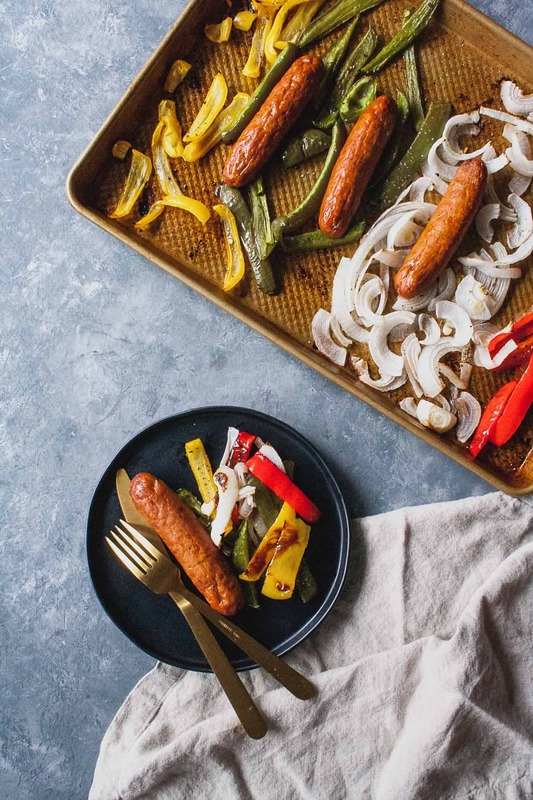 Here are a few of my other favorite sheet pan dinners!